(including Mrs. Edith Roosevelt if you desire). We come in period correct clothing as President and Mrs. Roosevelt during the White House years. During the presentation, we discuss current (1901 - 1909) topics and present a biography, in first person, if you would like. 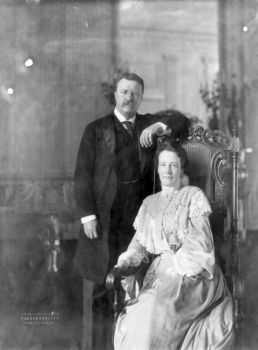 At the end of the program, we discuss TR and his family after the White House years. I come dressed in a reproduction of the uniform TR wore on July 1, 1898 when he and the Rough Riders (1st US Volunteer Cavalry) made the famous charges up Kettle Hill and the San Juan Heights. I describe how the Rough Riders were formed, what life was like with the Rough Riders, and what the Rough Riders endured and accomplished. At the end of the program I discuss what happened to TR after being Colonel of the Rough Riders. Julia, dressed as Mrs. Edith Roosevelt, shares stories of her life and family. She describes what it was like to be the woman behind the man. Dressed as TR did when he visited Yosemite with John Muir in 1903, I describe how TR felt about conservation and preservation throughout his life, how his family felt about it, and how he saved more than 200 million acres of land for future generations to enjoy. I discuss TR's life and family but not in first person. I can also do this presentation dressed at a Rough Rider. My wife also presents about Edith's life. I discuss TR's life and family but not in first person. My wife also presents about Edith's life. With any presentation I can bring a collection of TR related items, if you would like. We would be dee-lighted if you would like us to present to your group or organization. Larry & Julia are from S. Charleston, OH. 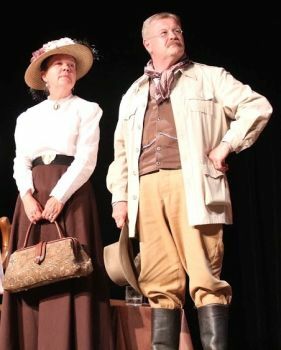 They have been portraying the Roosevelts for 18+ years. Larry is an elementary school teacher.